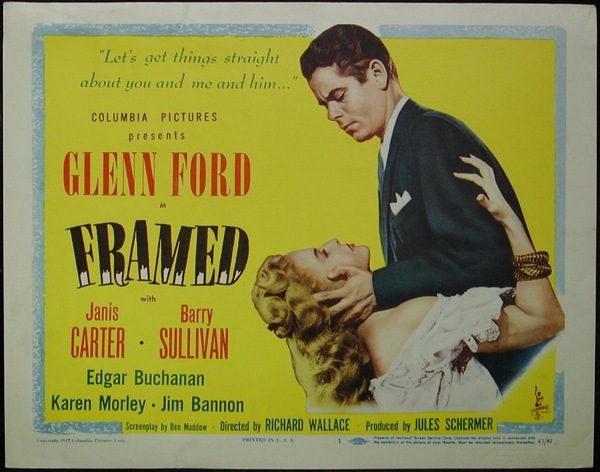 Tonight’s feature is FRAMED  starring Glenn Ford, Janis Carter, Barry Sullivan and Edgar Buchanan. Mike Lambert, unemployed mining engineer, arrives in a small town with a bang when the brakes fail on the truck he’s driving. After meeting seductive Paula at the La Paloma Cafe, he finds himself in trouble with the law. On the basis of a few burning glances, Paula pays his fine and finds him a room, but her motives are not what they seem. Mike lucks into a job with miner Jeff Cunningham, but against his will he’s drawn ever deeper into Paula’s schemes. This entry was posted in Film Noir Friday and tagged 1947, Barry Sullivan, Edgar Buchanan, Glenn Ford, Janis Carter, Jim Bannon, Karen Morley, Richard Wallace by Deranged. Bookmark the permalink.